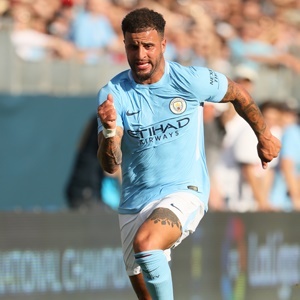 London - Manchester City defender Kyle Walker has apologised for being sent off in Monday's 1-1 draw with Everton. Walker, signed from Tottenham for £50 million in the close season, was dismissed for two bookings before half-time on his home debut at Eastlands. The England right-back earned his first yellow card in the 42nd minute for a foul on Leighton Baines. Just two minutes later, he was booked again as a collision with Dominic Calvert-Lewin triggered his dismissal. "Gutted with last night," Walker tweeted on Tuesday. "I apologise to the fans and my teammates. They did amazingly well to get back into the game and get a point." City were trailing to Wayne Rooney's 200th Premier League goal when Walker was sent off. But Pep Guardiola's side managed to escape with a draw thanks to Raheem Sterling's equaliser eight minutes from time.